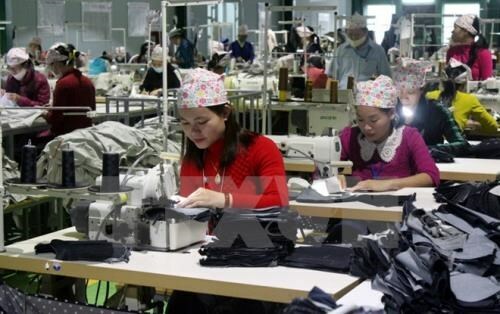 Hanoi (VNA) – Vietnam ’s workforce is estimate to reach 54.47 million in the second quarter of this year, accounting for 76 percent of the country’s above 15 year-old population, a slight rise of only 0.4 percent over the first quarter. A labour market bulletin for the first quarter released by the Ministry of Labour, Invalids and Social Affairs (MoLISA) and the General Statistics Office (GSO) on May 26 commented that slowing economic growth is posing problems for the employment and labour market. Some sectors are predicted to attract more labourers compared to Q1, including the processing and manufacturing industry is estimated to require 254,000 workers more, construction with additional 135,000 and communications with 187,000 more. However, even though the agro-forestry and fishery sectors and education will have less labourers, the unemployment rate is forecast to decrease by about 1.9 percent. In Q1, 53.29 million people were employed, 211,000 people higher than the same time last year. Three sectors with the highest rise in labourers were finance, banking and services, while the processing and manufacturing industry, agro-forestry and fishery saw a slight drop. Also in Q1, about 1 million people at working age were reported as unemployed, 20,700 people higher than in Q4 2015, including 411,000 skilled workers. At the end of Q1, 262 enterprises were licenced to send labourers abroad, with 23,000 workers starting in other countries and territories, mostly Taiwan (China), Japan , Malaysia and the Republic of Korea , down 2,000 people over Q4, 2015. The average monthly salary of employees was 5.09 million VND (roughly 270 USD), 417,000 VND (20 USD) higher than in Q4, 2015. The bulletin also revealed a rise in work accidents, mostly in construction, agriculture, mechanics and mining.